As the mounting protests from Maidan Square in Kyiv led to the resignation of President Viktor Yanukovych, Ukrainians found themselves at an unavoidable fork in the road in their history. For years the country had become a new frontier of Western influence, forcing a decision between tightening economic and cultural ties with the West or with Russia. The basic question many Ukrainians faced included choosing between their Soviet past or a potential liberal democratic future. Furthermore, the Russian takeover of Crimea became the first major invasion of a European country since 1968. 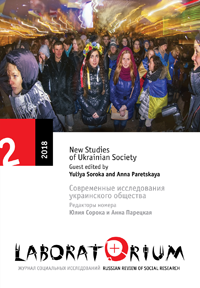 The goal of this article is to examine how Western versus Russian institutions and agents influence a third actor, Ukraine, in the postcommunist world. The following discussion will peel back the various layers of government, businesses, nongovernmental organizations, and people, both domestic and foreign, in the area of reform in order to establish how policymaking in Ukraine has been shaped. I consider the competing uses of hard and soft power in Ukraine’s reform movement, focusing on democratization and the role of specific anticorruption initiatives. Democratization concerns the liberalization of politics, loosening restrictions on policies, and developing responsive institutions. Anticorruption efforts target illegal activity propagated by an entrenched graft culture that undermines democratization efforts. I interviewed Ukrainian political elites, examining their perceptions of the ways in which foreign actors shaped reform policies. I contend that Moscow has used both hard power and soft power to undermine reform efforts. The West has relied on financial aid to bolster civil society groups and a new generation of civil servants to promote institutional capacity to further reform initiatives. Barrett, Ryan. 2018. “Reform in Ukraine and the Influence of Foreign Actors After Euromaidan”. Laboratorium: Russian Review of Social Research 10 (2), 80-103. http://www.soclabo.org/index.php/laboratorium/article/view/746.